Looper was excellent, I have to say. It deserves a place alongside the best dystopian time-travel films, 12 Monkeys and Primer, and in many ways, it compares favorably to them. It was stylish and earnest in equal measure, which is hard to pull off in our post-Tarantino era, and it was crafty and precise in its construction of an anachronistic gunmetal future. 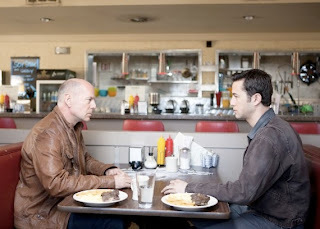 It's hard to maintain, with any seriousness, that any film -- Looper included -- could challenge the merits of 12 Monkeys and Primer, which are both justifiably held up as the best, sharpest, most uncompromising films in the time-travel genre. Still, I think there's a case to be made that Looper is more subtle than either of these leaving more room for a larger view of humanity. To talk about that, though, I'll probably spend most of my time talking about those other two movies. As a bonus, at the end of this entry, there's a thorough explanation of how I think the time-travel rules work in Looper, accounting for all the "paradoxes" that some armchair critics get so hung up on. Here's the thing about 12 Monkeys... in this film, there is a sense of complete helplessness on the parts of the main characters, as if fate is a storm they're caught up in (maybe I just have Sandy on my mind). For most of the film, James Cole is a confused, twitchy nutcase who can't seem to navigate basic social situations, much less act as an elite agent from the future. This mirrors the state of all the characters in the film, who don't really have much of a hold on their present or their future, and are at the mercy of the winds and waves of circumstance. After all, this is a strictly deterministic framework... everything that's happened must happen, even given the possibility of time travel. This kind of determinism leaves little room for humanity, except as an anxious, hopeless, and powerless little cloud of particles. For a science fiction movie with an impossible premise, this creates quite a harsh and inhospitable film. Primer is very different, but frankly, not much better. These characters DO have agency... in fact, they're flush with it. Whenever they use their time-travel machine, they spawn a new universe, where things can go differently from their source timeline. This allows them to treat their world as a simulation, or a specimen under glass... going back in time, they're essentially hitting a reset button, or opening up the glass case, tweaking some conditions, and letting the whole thing play out again, now differently. By building larger time-travel chambers, they can go back further, and their simulation enlarges to include their previous selves. It's a baroque, cynical story of what would happen if humans were able to operate the universe like a computer, or a massive complex machine. This is, in a sense, a perfectly INDETERMINIST universe, the opposite of 12 Monkeys. If a pair of humans can simply step outside the world, tweak a few switches (i.e. decide to place bets on certain stocks) and see how everything plays out, it suggests that there are no larger reasons, no absolute consequences, and no patterns that really hold, except by happenstance, meaningless collision, and mindless interaction. Whatever purpose or pathway the universe seems to have, people like Aaron and Abe can just step outside it. This is what gives the film its mechanical coldness... it's a drama of absolute agency, where the characters lose any of the resistance that allows them to assert their humanity. Looper manages to find a middle-path between these two options, which is why it can be cynical and sad and frightening, and also hopeful, with space for agency and heroism within the conditions created by fate and time-travel. In Looper, "fate" isn't deterministic... it's more like an attractor, or a gravitational force, pulling every iteration toward a certain path but still allowing divergence. Clearly, most versions of Joe outgrow Looperhood and travel the world, meet a certain woman, and then travel back in time. Most versions of Cid, unfortunately, become the Rainmaker. But at least one instance of Joe takes a different path, and at least one instance of Cid is saved from his fate. This, I think, is where Looper is better than either of those other time-travel films. It creates a space for humanity, somewhere between fate and free will, and it does this without being too sappy or soft around the edges. That creates the space for a few incredible moments -- Cid's rage, Seth's torture and murder, Abe's weathered, blithe melancholy -- that really gave definition to Looper, really set it apart from its colder, more nihilistic cousins. It also manifests a much more palatable pop sensibility as a result. As a bonus, I think Looper accomplishes this feat in a fluid, self-consistent way. This isn't obvious to everybody... lots of people got hung up on what they felt were "plot holes." As for me, on the contrary, I think, among all recent time travel movies, this is probably the most fun film to explain. I take it on faith that deep under all this convoluted plotting, there's some obscure set of rules that's self-consistent... that's the whole puzzle-game appeal of time travel movies, and at least for me, it's sufficient fuel for suspension of disbelief. Now on to the explanation, for those who want a way to understand this film so that there are neat patches and bridges over its internal contradictions. If you were inclined to dislike the film because of its time-travel paradoxes, you probably won't buy this, because why should you be any more sympathetic to my suspension of disbelief than to your own? But if you want to like the film, but are hung up on the time travel paradoxes -- like, How does Seth come back in time as a capable middle-aged man, when his young self has been mutilated and possibly murdered? -- I think this way of understanding the rules of the world will do the job. We start with the givens. Clearly time is not a deterministic, closed system, like 12 Monkeys... the whole action and resolution of the film belies this. So various parallel versions of the same timeline can be different. Also, there is a "first" timeline, where the Rainmaker is first traumatized, and a "final" timeline, where he's finally freed from his trauma. Those are just the initial premises. So how can this all fit together? In this system, time runs more like an endless spiral than an actual straight line or closed circle. In the very first loop, Cid was traumatized by something else... his mother was killed by a vagrant, maybe. So he becomes the Rainmaker, and takes over the Looper system, and just closes loops whenever they're scheduled to close, not because of some vendetta. In THAT loop, Joe's wife is killed, and Joe goes back to try to prevent The Rainmaker's rise. That starts an infinite cycle of loops, like a spring, with each coil (i.e. loop) being basically identical, save for a few minor differences. Every time, by trying to save his wife, Old Joe kick-starts the Rainmaker's reign of terror, and each time, the Rainmaker tries to close all of the Loops... maybe to prevent his mother from dying, or maybe just out of vindictiveness toward the Loopers who took her. This results in a psuedo-infinite, indeterminate number of loops, until eventually, one of the Young Joes realizes that the only way for him to end the cycle is to kill himself before he can create another Rainmaker. In this schema, it's important to note: a change in one timeline can cause sudden, drastic effects in the neighboring timelines, like an Old Joe from a previous timeline suddenly disappearing when the new Young Joe commits suicide. But they don't retroactively negate every coil in the spring... they just cause a kink in a couple loops. That's why you can have an Old Seth, who lived his whole life as an able-bodied man, but who is suddenly, drastically affected by amputations carried out upon his Young Self in an adjacent timeline. Working from this schema, the movie basically shows us three "coils" (loops). It shows us the very first loop, where Young Joe closes his own loop, then sails off to see the world and meet his wife. This loop ends with the rise of the Rainmaker, through some unexplained psychological trauma. The film also shows us the middle loop, which is repeated ad nauseam: when Old Joe appears, hoodless, Young Joe fails to close the loop. Young Joe then allows Old Joe to kill Sara. From there, Young Joe runs away, travels the world, and meets his wife; this is the loop that most of the film dwells in, and it's the loop we see concluded in Young Joe's imagination, with the murder of Sara. The film also shows us the final loop, which looks like the middle loop, except that Young Joe commits suicide before he can become Old Joe. All the timelines after that have no Rainmaker, and Cid grows up to become something more benevolent. That's how I make everything fit together. Now that I'm through with that, I can get back to thinking about the moral and metaphysical philosophy that's on display here. Lucretius, anyone?! ?